“See a penny pick it up / And all day you’ll have good luck” goes the old saying. In this particular case, that “good luck” is close to two million dollars. Beware: There’s a too-little, too-late aspect to this story that’s truly maddening, though. In 1947, savvy teenager Don Lutes Jr. found a 1943 on the floor of his school cafeteria and kept it. 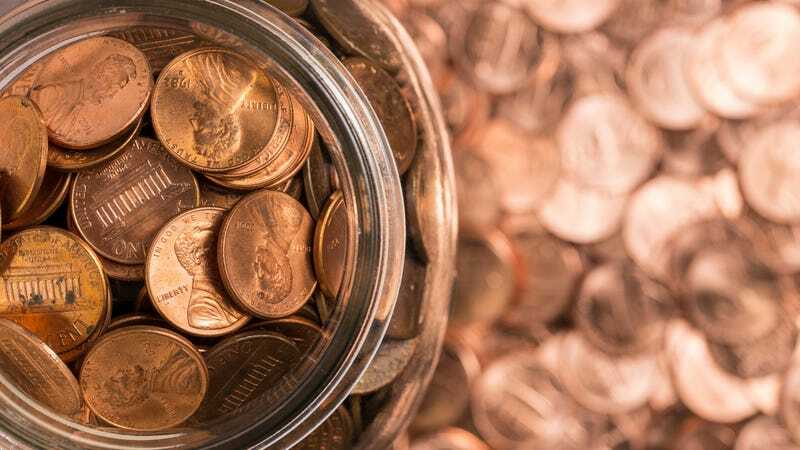 Because of World War II, pennies of that particular era were minted in zinc-coated steel, as copper was used for shell casings and other war-related efforts. The penny Lutes found was one of only 20 that was accidentally pressed in copper that year, making it extremely valuable. But the U.S. Treasury denied the existence of these coins, and rumors spread rapidly among collectors. Unfortunately, when Lutes contacted the Treasury about his coin, “reps told him the coin was fake,” says the New York Post. There was also a rumor that Henry Ford would give a brand-new car to anyone who presented him with one of the elusive 1943 pennies; Lutes struck out there as well. In fact, the value of the penny was only revealed when it was found in his belongings after his death last September. At least Lutes’ heirs will be able to take advantage of the spoils of the extremely valuable coin, which is set to be auctioned off at Heritage Auctions tomorrow, with an estimated price tag of $1.7 million. Personally, I’ll never bypass a penny again. Ask The Salty Waitress: I drunkenly under-tipped my server. How do I fix it?